Can Allahabad University bloom again in U.P. desert? The fourth oldest modern university of India (established in 1887 shortly after the Presidency universities of Calcutta, Bombay and Madras were decreed in 1857), Allahabad University (AU), once known as the Oxford of the East for its academic excellence and vibrant institutional culture, is struggling to regain its past glory. The alma mater of three former prime ministers (Gulzari Lal Nanda, Chandra Shekhar and V.P. Singh), one president, two vice presidents, well-known authors, artistes and senior bureaucrats (see box p.82), this 131-year-old varsity sited in the historic city of Allahabad (pop.1.21 million) — ill-advisedly being renamed Prayagraj by the state BJP government headed by prelate-turned-chief minister Yogi Adityanath — which was an epicentre of India’s freedom struggle and the hometown of its first prime minister Jawaharlal Nehru, has experienced a steep fall of reputation. Once the showpiece university of the Hindi heartland state of Uttar Pradesh (UP, pop.220 million), over the past four decades AU’s academic landscape has been marred by its steady descent into a whirlpool of student violence, corruption, caste politics, faculty recruitment scams and lawlessness. In the latest National Institutional Ranking Framework (NIRF) 2018 of the Union human resource development (HRD) ministry, AU is ranked a dismal #68 behind several newly promoted private universities. Thirteen years ago to enable its upliftment, AU was conferred Central university status through a special University of Allahabad Act, 2005 passed by Parliament. But this initiative has failed to rejuvenate or revive this once widely admired institution of higher learning. On June 6, an FIR (first information report) was registered by the UP police against 400 AU students following violent protests on campus over the administration’s decision to evict 4,000 of them from its 20 hostels for the summer break, and reallot hostel rooms in the new academic year beginning August. According to university spokespersons, a large number of graduated students have been illegally occupying the hostels with some renting their rooms to third parties, and the varsity’s hostels had become hubs of criminal and political activity. 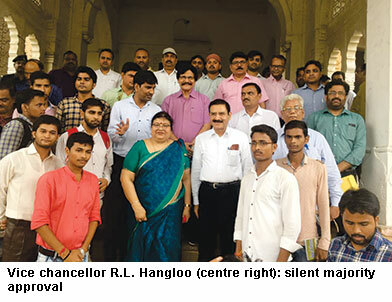 Following student violence, the vice chancellor’s office in the iconic Darbhanga Hall has been fortified and special iron grilled gates constructed near the gateway to prevent vandalism. “Some hostels were in the possession of criminals and we obtained an order from the Allahabad high court to forcibly vacate unauthorised personnel from the university’s hostels. 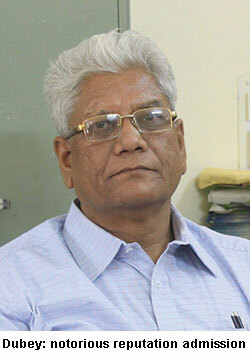 The police was implementing the court order when students abetted by anti-social elements, began vandalising university property and then the city,” says Prof. Rattan Lal Hangloo, appointed the university’s 53rd vice chancellor in December 2015 by the newly-elected BJP/NDA government, which was voted to power at the Centre the previous year. 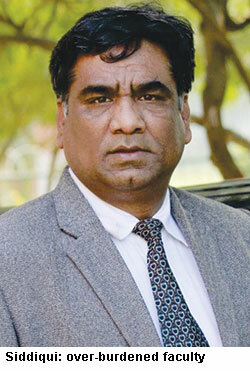 An alumnus of Kashmir and Delhi’s Jawaharlal Nehru universities and former professor of history at Hyderabad Central University who won wide acclaim for his competent leadership of the University of Kalyani, Nadia (West Bengal), Hangloo was appointed VC with a specific brief to depoliticise and decriminalise the campus and rejuvenate academic and research activities on AU’s four campuses which host 25,000 students. 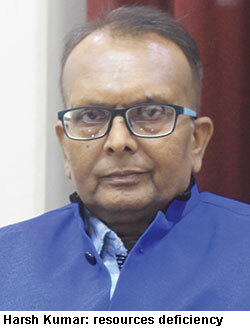 Soon after he took charge, the “pathetic state of the university” prompted him to write an “SOS letter” to then President Pranab Mukherjee, visitor of AU and ex officio chancellor of all Central universities. In the letter dated December 15, 2016, Hangloo lamented “complete policy paralysis with no quality academic contribution and very poor infrastructure to match the stature of a Central university”. “I had heard many great things about Allahabad University and was honoured to be appointed vice chancellor,” recalls Hangloo. “But soon after I assumed office in 2015, my perceptions about this once-great institution were shattered. There was no academic environment; faculty and employees were fearful and students demotivated. Some of the university’s buildings and hostels were illegally occupied by graduates and outsiders. Some staff in administrative positions were involved in brazen corruption and favouritism. The appointment of a succession of ill-qualified and incompetent vice chancellors had resulted in the near collapse of AU. At the time, I believed it was my duty to write to the President to inform him about the corruption and mismanagement that was rife in this ancient seat of learning. Nevertheless over the past three years despite severe opposition by vested interests, I have initiated several overdue reforms including eviction of unauthorised personnel from student hostels, renovation of academic facilities, and restarting the process of recruiting faculty after a gap of 22 years. But inevitably, I have to routinely fight allegations of mismanagement and corruption against me,” says Hangloo. Reportedly irked by Hangloo’s direct letter of complaint to the President and chancellor of the university by-passing the ministry, in October 2016 the HRD ministry issued a show-cause notice to Hangloo to explain several charges of financial irregularities against him. In response, Hangloo sent three volumes of replies with explanations and evidence. His direct confrontation with the HRD ministry, which has reportedly won over Union HRD minister Prakash Javadekar, has also won him the approval and support of the silent majority in the university and citizenry of Allahabad. 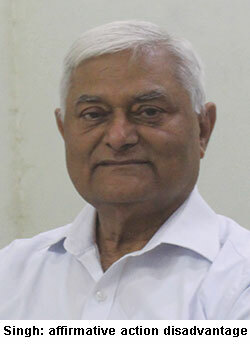 Satish Agarwal, a former AU student union president and a professed Lohiate (adherent of the caste-based socialism propounded by the late freedom fighter Ram Manohar Lohia (1910-1967)), who now works in the UP state legal cell of the BJP, believes Hangloo deserves the support of all right-thinking people as he has undertaken a determined drive to clean the Augean stables of AU. “The unholy alliance of corrupt bureaucracy, academicians, politicians and businessmen has cost the university dear and every right-thinking individual in Allahabad and Uttar Pradesh should welcome Prof. Hangloo as a messiah. 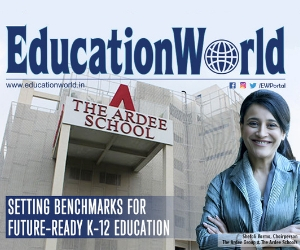 He has already begun the process of reform and upgradation and should be fully supported in his efforts to revive this prestigious institution,” says Agarwal. Sprawled across four campuses with an aggregate land area of 232 acres distinguished by heritage buildings designed in the Indo-Saracenic style and green lawns, AU was established on September 23, 1887 as the Muir Central College, named after Sir William Muir, Lt. Governor of the United Provinces. 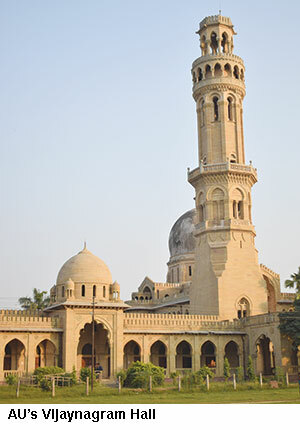 Subsequently, it transformed into the Allahabad Central University after its incorporation Act was passed in 1887 and it was granted degree awarding powers. In 1904, the Indian Universities Act was legislated which limited the territorial jurisdiction of Allahabad University to the United Provinces of Agra and Awadh, the Central Provinces including Berar, Ajmer, Mewar and most of the states of Rajputana and Central India Agencies. Between 1887-1927, AU affiliated 38 colleges in its jurisdictional area. After independence, the university accepted affiliation applications of several arts, commerce, science, and law colleges. 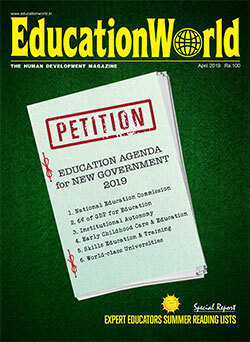 Currently, it has 10 colleges with an aggregate enrolment of 31,450 students and 1,279 teachers, affiliated with it. The location of AU in the United Provinces (renamed Uttar Pradesh after independence), the crucible of Indian politics and the freedom movement, ensured that the university occupied pride of place in pre-independence India, and most importantly, provided intellectual stimulus for the country’s freedom struggle. The entrance leading to the university’s main campus boasts a memorial dedicated to student leader Lal Padmadhar Singh, who was shot dead in the Quit India uprising of 1942. Moreover, Anand Bhavan — the home of Congress stalwart Motilal Nehru, Congress president in 1919-20 and 1928-29 and father of Jawaharlal Nehru, India’s first prime minister — is a short walk from AU’s main campus. Therefore unsurprisingly AU’s distinguished alumni include former president Shankar Dayal Sharma, former prime ministers V.P. Singh, Chandra Shekhar and Gulzari Lal Nanda, Bharat Ratna Madan Mohan Malviya, 11 chief ministers of several Indian states including G.B. Pant, H.N. Bahuguna, N.D. Tiwari and Arjun Singh. Legal luminaries include several chief justices of India — Ranganath Mishra, J.S. Verma, R.H. Pathak, M.H. Beg and K.N. Singh. Dubbed a nursery of bureaucrats, AU has also shaped generations of senior secretaries of the government of India (see box p.82). “Allahabad University was once renowned for its academic excellence, brilliant faculty and bright students driven by strong desire to contribute to India’s national development effort. Right until the early 1980s, the academic culture was so competitive that university hostels competed in terms of the number of top civil servants they produced. Faculty would offer free extra classes to students preparing for the civil services exam. Unfortunately, this academic culture has since disappeared and in recent years, the university has acquired a notorious reputation for corruption, student violence and lawlessness,” admits Dr. Ram Sevak Dubey, president of the Allahabad University Teachers Association (AUTA) and head of the university’s Sanskrit faculty. The consensus of informed opinion within AU is that this formerly stellar university’s fall from grace began in the 1970s with the state government incrementally tightening its grip over the university’s administration, resulting in politicisation of the campus and nepotism in faculty appointments. Moreover, with private investment in industry discouraged in the heady years of Indian socialism as practised by Congress governments at the Centre and in Lucknow, the university was starved of funding for infrastructure expansion to meet growing student enrolments. With populist politics freezing students’ tuition fees, faculty recruitment was also frozen with some vacancies unfilled for over 30 years. According to knowledgeable monitors of UP politics, the descent of the state into a quagmire of casteism, corruption, political horse-trading and lawlessness in the 1970s was accelerated after the Mandal Commission’s report recommending reservation of 27 percent of seats for ‘other backward castes’ in higher education and faculty recruitment was passed by Parliament, and upheld by the Supreme Court in 1990. These political initiatives which led to the rise of UP’s caste-based Bahujan Samaj Party led by former school teacher Mayawati, and Samajwadi Party led by former wrestler Mulayam Singh Yadav, opened a Pandora’s box of caste antagonisms and politics whose viruses have divided the students body and faculty and bedeviled academic life. “The University of Allahabad began its decline during Congress rule as (prime minister) Indira Gandhi turned her party into an apparatus of nepotism and corruption. The decline accelerated during the regimes of the BSP and the SP, the former indifferent to student life, and the latter actively engaged in criminal activity. After decades of neglect, many students reposed their hopes in the Modi government and made him the vehicle of their future aspirations. As the aspirations of the students turn rapidly to dust, it is crucial to remember that the University of Allahabad is not JNU. It is bigger and more significant in regional politics. Damage done to students’ lives here will have reverberations elsewhere,” writes Pankaj Singh, an alum of AU and currently research scholar at the Centre for Historical Studies, Jawaharlal Nehru University, in firstpost.com (May 7, 2017). However, with the virus of caste-based antagonisms and controversies about reservation quotas having permeated the campus, by end-1990s AU was in a shambles and the idea of bailing out the university by converting it from a state to Central university began gaining ground. The argument in favour was that Central university status would free the institution from the strangulating control of the state government and rustic politicians, and provide greater funding. 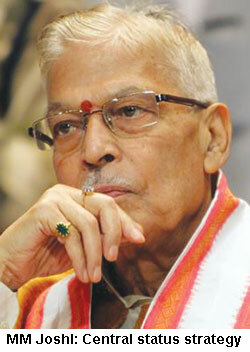 Dr. Murli Manohar Joshi, an alum of AU and Union HRD minister in the BJP-led NDA government (1999-2004), introduced the University of Allahabad Bill, 2004 in Parliament to confer Central university status on it. However, Joshi’s Bill was defeated in the Rajya Sabha in February 2004, because of stiff opposition from the Congress and Samajwadi parties. This failure cost Joshi, who also taught at AU for nearly four decades as physics professor, the 2004 Lok Sabha election from the Allahabad parliamentary seat after AU teachers aggressively campaigned against him. However, his successor in Shastri Bhavan, Arjun Singh, Union HRD minister in the UPA-I government and also an AU alum, successfully piloted the University of Allahabad Bill, 2005 through Parliament. On June 24, 2005, AU was conferred Central university status and simultaneously designated an Institute of National Importance. “In the new millennium, it had become painfully apparent that the state government didn’t have the resources to overhaul Allahabad University which needed major funds infusion. At the time, the state government’s annual grant to AU was a mere Rs.40 crore — clearly insufficient for infrastructure and academic upgradation. The university required an annual grant of ten times that amount. Hence the campaign for Central university status,” recalls Harsh Kumar, professor in the department of ancient history, culture and anthropology. With the conferment of Central university status on AU in 2005, the annual grant to the university did improve substantially, but it also provoked outrageous corruption by a succession of mediocre vice chancellors appointed on other than merit considerations. In particular, the power of vice chancellors to recruit faculty and award contracts for expansion and maintenance of the varsity’s sprawling 232-acre campus resulted in intense politicking for the post. “Unfortunately AU has had a string of incompetent VCs. Before the university was conferred Central status, VC Chuni Lal Khetrpal ensured that he benefited personally, rather than the university. Prof. Rajen Harshe who succeeded him messed up the university further by sanctioning construction of buildings without any budgetary provision. The buildings commissioned by him and due to be handed over to the university in 2009, have not been completed even now,” says Hangloo. Following widespread public outrage and demand from the faculty, in 2010 President Pratibha Patil constituted a search committee headed by R.A. Mashelkar, former director general of the Council of Scientific and Industrial Research, to select a new vice chancellor. In January 2011, the search committee recommended distinguished academic Dr. A.K. Singh, an alum of IIT-Kanpur, Florida State, Hawaii, and Columbia universities with over two decades of admin and teaching experience in IIT-Bombay, who was duly appointed VC in 2011. However by then, a deep-rooted culture of corruption, orthodoxy, mediocrity and favouritism had permeated the university dividing faculty, students and non-academic staff on the lines of caste, community and political ideology. With every administrative and academic reform introduced by Singh sabotaged by powerful caste and community groups opposed to each other, following an indefinite strike called by the university’s non-teaching staff and protests by students against the deteriorating academic environment, Dr. Singh resigned his office in July 2014. After his departure, two pro-tem vice chancellors were appointed who further messed up things at the university. Inevitably, as soon as Hangloo began the process of reforming and overhauling AU’s administration, groups of teachers, students and local vested interests who had forced his predecessor Dr. Singh to resign, began to resist. A large number of complaints ranging from corruption to harassment of SC/ST students were filed against him with the HRD ministry, and planted in the media. Within AU’s beleaguered faculty, there’s widespread agreement that a critical faculty shortage is crippling this vintage university. Currently, there is a 50 percent teacher shortage with 528 sanctioned faculty posts vacant. 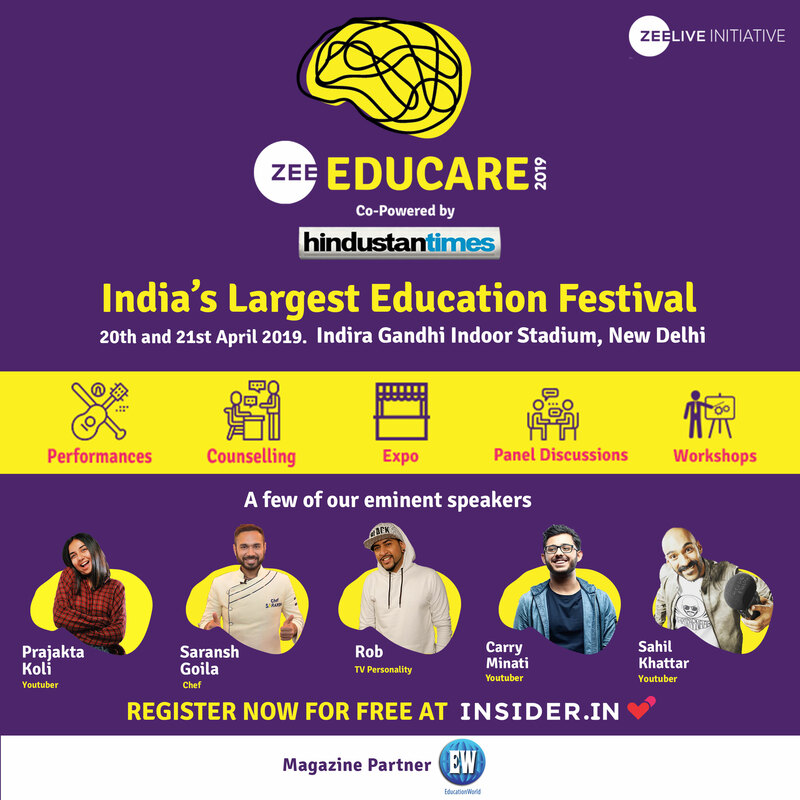 Unsurprisingly, 445 full-time faculty is not equal to the task of tutoring 25,000-plus students in a higher education institution in which the teacher-pupil ratio has risen to 1:51 as against the UGC prescribed norm of 1:25. There are too many vested and corrupt interests inside and outside the university who sabotage every recruitment initiative because their favourites are not shortlisted. As soon as any recruitment process begins, there are disputes about the composition of selection committees and individuals who are not shortlisted, file cases and get stay orders from the courts. The shortage of faculty has crippled teaching, and left academics with no time for research. It’s impossible for professors to work on research and consulting projects after teaching all day. And insufficiency of research papers is a major cause for our low NIRF ranking,” says Prof. A.R. 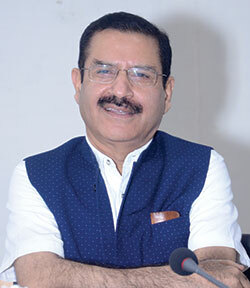 Siddiqui, an alumnus of AU, vice president of the Allahabad University Teachers Association (AUTA) and NIRF nodal officer and professor in the faculty of geography. With narrow-minded caste, community and identity politics, which has become the leitmotif of Uttar Pradesh politics since the 1990s spilling over into university campuses, AU has become a hotbed of political ferment. National and regional parties such as the BJP, Congress, BSP and SP have infiltrated the campus, and through their apparatchiks, many of whom are illegally residing in the varsity’s hostels, incite frequent protests and often violent agitations. Even though student union elections were suspended from 2005-2012 because of the brutal murder of a student on campus, and since then student unions have been strictly circumscribed, the AU campus remains a hotbed of politically charged student activism. For the past five years, the Samajwadi Party’s student wing, the Samajwadi Chhatra Sabha (SCS) has been ruling the student union. In 2017, AUSU president, Avinsih Yadav was under investigation for hiring an impersonator to write his exams. “Student protests and agitations on the smallest pretext are normative in AU. But much of the violence is prompted and abetted by criminal elements not registered in AU and illegal hostel residents. Though student union members are not part of any administrative or academic committee, elections are bitterly fought. I believe Samajwadi Party chief and former UP chief minister Akhilesh Yadav is responsible for introducing caste politics and polarising the campus,” says Kunwar Sahib Singh, a student leader who contested unsuccessfully for the post of president in the AU student union election this year and is a second year English research scholar. 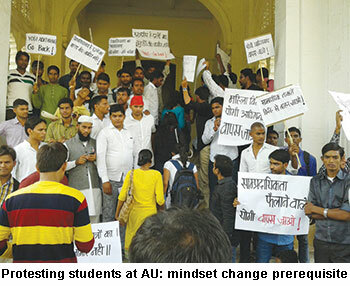 Academic standards and learning outcomes have also plunged in AU over the past three decades because the student profile of the varsity has changed drastically with a large number of students from villages in neighbouring Bundelkhand and Terai, and backward states such as Madhya Pradesh and Jharkhand being admitted. As a Central university, AU is obliged to reserve 49 percent of seats for SC, ST and OBC students who continue to receive low grade primary-secondary education, especially in rural schools. “Once upon a time, AU attracted bright and best students from across the country. But over the past few decades, large contingents of our students are from small towns and villages in UP and neighbouring states admitted under affirmative action. Poor learning outcomes in primary-secondaries in rural UP and neighbouring states have imposed great stress on our faculty to maintain academic standards,” says Prof. Jagadamba Singh, dean of AU’s science faculty. Politicisation of AU and admission of half the annual students intake under the affirmative action policy of the Central government coupled with the omnipresent threat of violent student protests have forced tuition fees to be frozen at Rs.1,200-1,500 for over two decades, and cannot be raised. Therefore, tuition fees contribute a mere 1 percent of the university’s annual budget of Rs.446 crore, leaving AU abjectly dependent on grants of the Union government to fund infrastructure expansion, teacher recruitment and academic innovations. Inevitably, AU’s 20 hostels which house 4,000 students are in dilapidated condition with water seepages and leaking roofs being normative. Residential accommodation is free-of-charge for SC/ST students while others have to pay a nominal Rs.13,000 per year for double sharing and Rs.14,000 for single rooms as rent. Mercifully, the university’s Indo-Saracenic heritage buildings have been recently refurbished and several new buildings are also mushrooming, as per a new development plan. Spread across four sites within a radius of 7 km in the city — Senate area, MCC, Chauhan Lines, and Beli Farm — the AU campus hosts well-equipped science labs and a well-stocked library. However, wi-fi and state-of-the-art IT technologies are in scarce use. Miraculously, despite frequent disruptions of academic life rooted in rock-bottom tuition fees, persistent political interference, and widespread favouritism and nepotism in faculty recruitment, a few islands of academic excellence have survived in this vintage university. “AU continues to host the country’s best basic sciences and law faculties. We receive 200 admission applications per seat in our basic sciences faculty and the annual admissions rush into our botany school headed by renowned botanist Prof. N.B. Singh is particularly heavy. Our law school has also retained its lustre. An estimated 90 percent of UP Public Service Commission (PCB) and judicial officers are graduates of the university’s law faculty,” says Prof. Harsh Kumar, who also doubles as the university’s public relations officer. Yet an indicator of the ivory tower existence of this historic university is that it didn’t have a placement cell for graduates until last year. With most graduates busy writing UPSC entrance and state government exams for government jobs, a placement cell for entry into private sector companies was unnecessary. “It has been a challenge to change the mindset of students about corporate jobs as AU has a reputation for producing civil servants and bureaucrats. But with regular workshops, we are creating awareness about careers beyond the government and public sector where jobs are becoming scarce. Last year for the first time, private companies such as Svatantra Microfinance Pvt. Ltd and NGOs such as Azim Premji Foundation hired AU graduates,” says Shaswat, an alumnus of Sam Higginbotham University of Agriculture, Technology and Sciences, Allahabad and AU’s newly appointed placement officer. To his credit, since he was appointed vice chancellor in 2015 Hangloo has undertaken overdue initiatives to modernise this ancient institution of higher learning. Among them: introducing an online admissions process, digitalising and modernising the university’s financial system to ensure transparency, and sanctioning the construction of three new hostels. Moreover last year, AU introduced several postgrad skills diploma programmes and signed collaboration partnerships with universities in Germany and America. Now AU is a member of the Joint DBT-Heidelberg University Graduate Programme on Big Data Research together with IIT-Madras, IIT-Kanpur, IIT-Guwahati, and Delhi’s Jawaharlal Nehru University. “I believe it’s entirely possible for AU to regain its past glory by weeding out corrupt practices from campus politics, introducing contemporary study programmes, upgrading infrastructure, cleansing the university of anti-social elements and recruiting competent faculty. But for these initiatives to succeed a mindset change in the university’s teachers and student communities is a prerequisite. A corruption-free and impartial administration which resists unwarranted political interference supported by the silent majority within the student community and faculty can repair and restore the once-great academic reputation of AU,” says Hangloo. 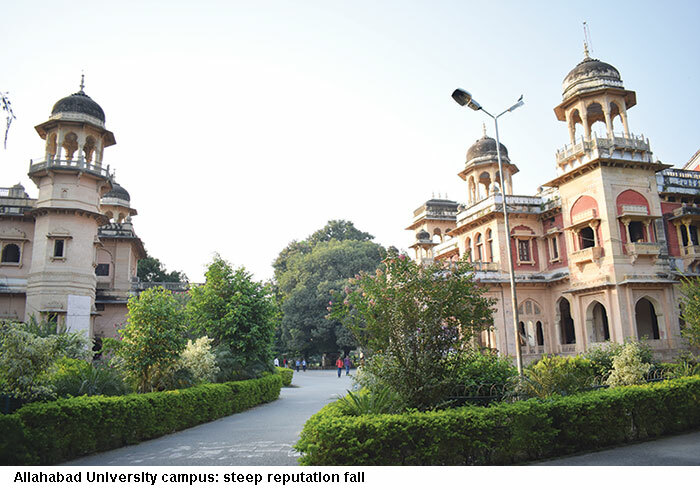 Once the crucible and epicentre of India’s successful freedom struggle against foreign rule and a widely admired centre of excellence of higher education, Allahabad University is struggling to survive the spillage of UP politics permeated with toxic caste, communitarian and religious antagonisms which have seeped into its four campuses. In the national interest, the incumbent administration’s effort to restore the academic and administrative autonomy and cleanse the Augean stables of this once venerable institution needs the support of all right thinking members of society. Autar Nehru interviewed Dr. Rattan Lal Hangloo, vice chancellor of Allahabad University, in his office sited in the imposing Darbhanga Hall. Excerpts. You took charge as vice chancellor of Allahabad University at a time when the university was facing a major corruption scandal and its reputation was at a nadir. What are the major factors behind AU’s steady decline in public esteem? I had heard many great things about Allahabad University and was honoured to be appointed vice chancellor. But soon after I assumed office in 2015, my perceptions about this once-great institution were shattered. There was no academic environment; faculty and employees were fearful and students demotivated. Some of the university’s buildings and hostels were illegally occupied by graduates and outsiders. Some staff in administrative positions were involved in brazen corruption and favouritism. The appointment of a succession of ill-qualified and incompetent vice chancellors had resulted in the near collapse of the university. Most of the hostels were occupied by graduated students and even criminal elements. The Allahabad high court had ordered us to evict them from student hostels. We followed the orders of the high court and cleansed the hostels of criminals and illegal activities. Initially, students protested but now things are better. We have big plans to improve residential accommodation. I have been able to get sanction for construction of three new hostels and a new classrooms complex for which we have raised Rs.11 crore from alumni. Implementing any reform and upgradation programme is challenging because opposition from vested interests with stakes in the status quo is inevitable. For instance, repair of one hostel was held up for seven years reportedly because some students demanded a commission from the contractor. I have taught in Central universities for 35 years but nowhere have I encountered such brazen corruption. However, we are overcoming these challenges. AU is facing a huge faculty shortage crisis with 60 percent vacancies. This has adversely affected teaching and research. How are you addressing this problem? This is a serious issue. There are 600 teacher vacancies in AU and the teacher-student ratio of 1:51 is alarming as no major faculty recruitment drive has been initiated in the past 22 years. Within a month of my appointment, I set about filling vacancies but people with vested interests went to court alleging nepotism. The Allahabad high court ruled in our favour and we re-advertised to fill urgent vacancies. But this time, the University Grants Commission has delayed the selection process because a special leave petition has been filed in the Supreme Court against the recruitment process. Unfortunately, suits and counter-suits are delaying the entire process. Currently, we are heavily reliant on guest faculty and Ph D research scholars helping out. But this is not the solution as students are suffering loss of learning and AU loss of reputation. Over the past three years, you have introduced several infrastructure and academic upgradation measures. 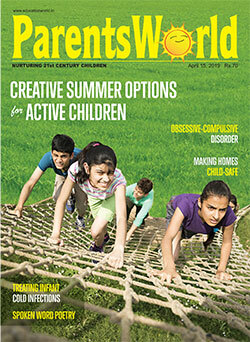 Please highlight the major initiatives. The university lacks adequate infrastructure. When the Supreme Court directed universities to admit OBC students without decreasing the number of merit seats, the number of students increased by 60 percent. But infrastructure facilities were not enhanced commensurately. There is no large auditorium and the classrooms and labs also need urgent upgradation. We have started by renovating the administrative block and have set up a state-of-the-art 24/7 computer lab. Several new postgrad courses such as Master of computer applications have been introduced and our Centre for Cognitive and Behavioural Sciences which is rated the best in South Asia, has been upgraded into a centre of excellence. But there is urgent need to construct new hostels because some of them are more than hundred years old, and require immediate renovation and repair. Over the past year, we have also signed academic collaboration agreements with universities in Germany and the US. Moreover, the Union government’s department of science and technology has increased grants for our science departments which has given a boost to our research activities. What are your future growth and development plans for the university? Allahabad University has its own peculiar set of problems which has hurt its academic and institutional reputation. Therefore, restoring the university’s academic and research culture by weeding out corrupt practices is our top priority. In addition, we have drawn up plans to introduce several contemporary study programmes, upgrade infrastructure facilities, cleanse the university of anti-social elements and recruit competent faculty. But for these initiatives to succeed, there has to be a mindset change in the university’s teacher and student communities, as also within the political establishment. Corruption-free and impartial administration free from political interference and a non-politicised student body are crucial for AU to regain its lost reputation.